If you refuse to be baptized in water or to partake from the Holy Communion, then you are not born again. We remembered Jesus Christ, His person, His birth, His youth, His baptism in the rived Jordan, His wonderful works amongst men. But we especially remembered His words. You cannot remember Jesus, if you do not know Him personally. The more you study the Word of God, the more you remember Jesus, for He is the Word incarnate. The more you study the Word of God, the more you ‘gain’ from the revelation of the Lord’ Table. The bread and the wine is a symbol of the Body and Blood of Jesus. 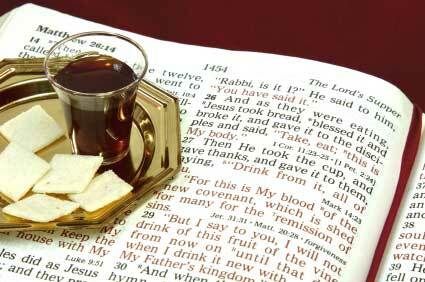 As food is for the body, so the Holy Communion taken by faith feeds and strengthens the soul and the spirit. We remembered Jesus not from pictures or from imagination, but especially from the Word of God. That is the sure revelation! The Holy Communion is a sermon; a visual sermon that speaks especially to the conscience. We proclaim His death until He comes back again. We shall lift up the Cross until He comes back to take it from our hands. We are coming to the Lord’s Table with the right attitude. We come with faith, with love and with hope. We do not take the cup ‘unworthily’. This word is an adverb. It is connected with action. It does not mean that we are unworthy of His gift of love. The truth is that indeed, we are unworthy to receive anything from God. But the word here describes the action of taking the bread and the wine, not our standing with God. We are not carless, ignorant, joking, doubting or pretending as we partake from His table. The Holy Communion cannot be taken alone. You cannot sit alone in your room and partake from the bread and wine. It is designed to be as fellowship with the Lord and the brethren. The Lord’s Table should help us to appreciate the Assembly of God’s people, the power of being one with others in the Body of Christ. The Holy Communion is a gift to open the door for singles in the church to marry other believers. Have faith! When we take the Holy Communion, Jesus did not ask us to remember names, or places, or things or even doctrines. We are to remember Himself, our Lord and God. After taking the Holy Communion ‘worthily’, something wonderful happened that sealed our obedience to God’s Word. The Holy Spirit ‘fell’ upon the whole congregation. Suddenly, great joy, ‘inexpressible and full of glory’, came as shower upon a thirsty land. A blanket of compassion and freedom covered the whole congregation. All peoples stood up and shouted for joy, sang and danced for more than an hour. Fear, doubt and depression ran away. Faith, strength and healing came in. If you have taken the Holy Communion and nothing good, no miracle happened… then you have not taking it well! Pray for a fresh revelation of the power and glory of the Holy Communion! All glory to the Lamb upon the Throne who shed His Blood for our salvation!